The dragon is the fifth symbol in the Japanese Zodiac. 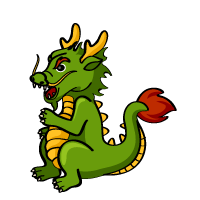 In ancient China, dragons were associated with power, and only the Emperors were allowed to use the symbol. This sign represents “justice” and “trust”. Dragons are energetic, brave, honest, and can inspire trust in almost everyone. However, they are also short-tempered and very competitive, so they tend to have as many enemies as friends. Speak their mind without reservations. Dragons are most compatible with monkeys and rats. If these three come together, it generates a great positive power. Dragons also have a mutually beneficial relationship with roosters. Dogs are the least compatible with dragons. In Japanese, a dragon is “tatsu” in romaji, and is written as “龍” or “竜”in kanji. In the Japanese Zodiac, however, it is written as “辰”.